The recent announcement by Aetna Insurance Company that it will exit the health insurance market in most of the states where it now operates raises a fundamental question about the stability of the Affordable Care Act. 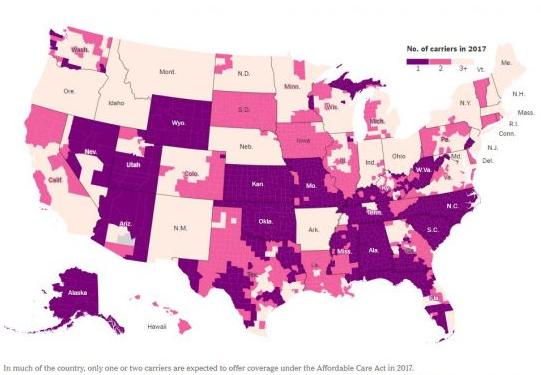 As shown by the following map from yesterday’s New York Times, it appears that at least five states with 17% of the American population will have only one health insurer to choose from next year. Insurance is supposed to price risk but the ACA changed this. Insurers can no longer charge or exclude coverage for pre-existing conditions, charge men and women different rates, or charge older customers more than three times as much as the young. For example, a 64-year-old consumes six times as much health care as the average 21-year-old. Adhering to the 3-to-1 maximum ratio, the insurer would have to greatly overcharge the 21-year-old than his actual cost and/or greatly undercharge the 64-year-old. The rational response for unsound pricing is for young and healthy customers to stay away and sick, older customers to flock to the exchanges. ACA mechanisms to prevent this type of behavior aren’t working very well. One example of this is that the ACA exchanges, which provide income-based subsidies for those without employer provided health insurance, are mainly attracting those people just slightly above the poverty line who get the biggest subsidies (see chart). I have pointed out many times that the cost of health care, especially for the entitlement programs of Medicare and Medicaid, is the fundamental driver of our exploding national debt and therefore must be curtailed. 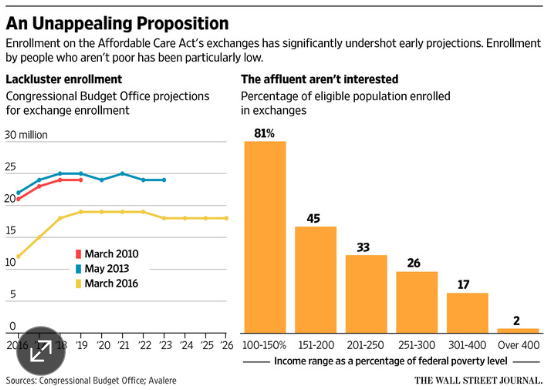 But now, in addition to the cost problem, we are discovering that the ACA also has a fundamental access problem as well. Big changes are clearly needed in the ACA. More details later! This entry was posted in ACA, Affordable Care Act, Greg Ip, health care, health care spending, health insurance, healthcare reform, Jack Heidel, New York Times, Wall Street Journal and tagged Affordable Care Act, debt, fiscal responsibility, health care, jack heidel, Wall Street Journal by jackheidel. Bookmark the permalink.